Lakers fans will love these new kicks. If you think about what the most iconic Jordan shoe is, the Jordan 1 is probably one of the first models to come to mind. For some, the 3, the 4, the 6 and even the 11 are much more iconic, but for many, the fashion-forward nature of the Jordan 1 is simply unmatched. Jordan 1's are like a Chuck Taylor or a Vans Old Skool in the sense that you can pair them with almost anything and it will look good. 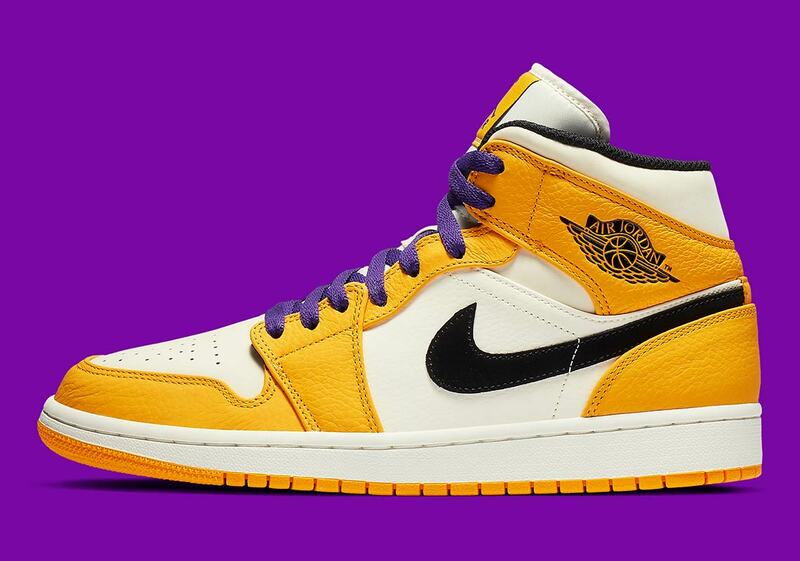 There is what seems to be an infinite amount of Jordan 1 colorways and Jordan Brand is looking to add another one as they are bringing some Lakers colors to the Jordan 1 mid. One of the most iconic NBA teams and one of the most iconic shoes come together for a colorway that sees white leather on the toe box, sides, and tongue. Meanwhile, the leather overlay is in that signature yellowish-gold Lakers tone, while purple laces add a pop of color to the sneaker. A black Nike swoosh adds the finishing touches to the shoe. According to Sneaker News, these fresh kicks have no release date yet but should be released quite soon. They will retail for $120 USD and will most likely be found at Nike.com and select Nike retailers.